Texas Labradoodles contact and pricing information is below. Our puppies are spayed/neutered, micro-chipped, have age appropriate shots, worming and a two year health guarantee against genetic defects. Our puppies are registered as multi-generational Australian Labradoodles with the ALAA. Texas Labradoodles puppies are spayed/neutered, micro-chipped, have age appropriate shots, worming and a two year health guarantee against genetic defects. Please refer to our puppy checklist for more information about how to prepare for your new puppy. Are all puppies spayed/neutered at 8 weeks old? Yes, we do not let a puppy leave our care unless it is spayed/neutered or has been designated as a breeding dog. We believe this is the most responsible way to breed dogs. If all puppies were spayed/neutered before leaving their homes the incidence of unwanted litters would be reduced to nothing, therefore, reducing the number of dogs in shelters to a minimum. Is it safe to spay/neuter puppies at 8 weeks old? Our vet feels this is a safe and responsible to do early spays and neuters, as does the ALAA. We have been doing early spays and neuters for almost 14 years and never had a problem, so we do feel that we know this is a safe and responsible practice. What shots do they have at 8 weeks old? The first round of shots that our vet gives at 8 weeks old is the DHPP. This begins the building of the immune system independent of mom’s antibodies. The most important and common diseases that are dangerous for dogs in Texas are Parvo and Distemper. 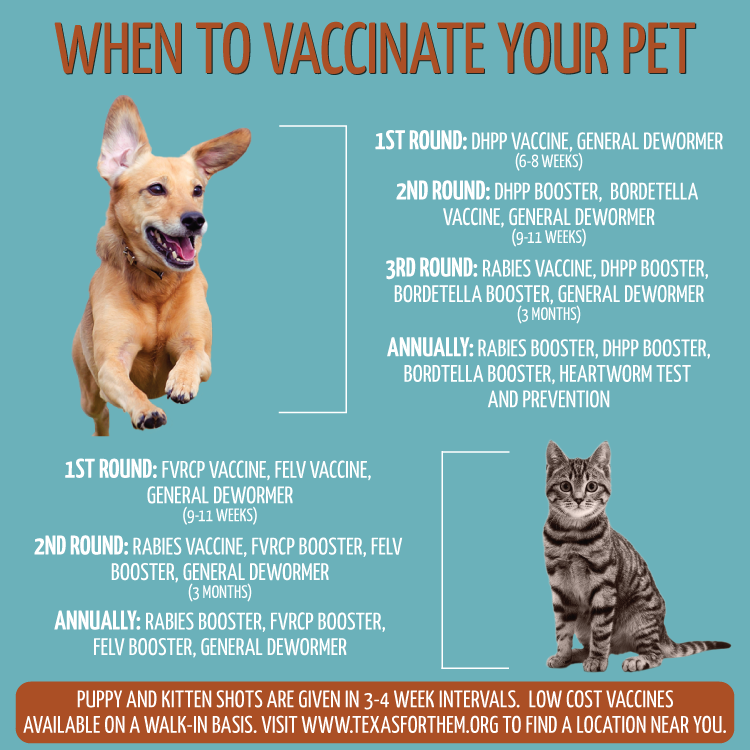 What is the shot schedule for puppies and how many shots do they need? Yes, our vet worms every puppy at 8 weeks old to avoid any false negative worming tests. This lets us be 100% sure our puppies leave our home parasite-free. When do they start heart worm preventative? Our vet recommends they start Heartguard at 8-10 weeks old and that they take Heartguard once a month. Heartguard prevents heart worms, as well as protects your dog from other common canine parasites that are easily found in soil or transmitted by fleas. When do you recommend starting flea and tick prevention? I personally do not like to treat my dogs for fleas and ticks unless we see a flea or tick, which has been rare over the years. I do believe it’s best to keep things as natural as possible. That being said, I do keep a dose of Frontline around in the spring and summer months so that if we see anything, we can treat quickly. I do not like any of the chewable flea and tick preventives with the exception of Bravecto. We did have a tick outbreak about 5 years ago and no organic options were working. It became dangerous not to do an oral treatment due to tick-born illnesses. The reason I find Bravecto acceptable is because it has been tested on gestating and lactating females and found to be safe. Again, I would use Frontline only if I saw a flea or tick and then if I had a problem with ticks, I would use Bravecto for treatment because of the testing for safety by the company. All of our breeding dogs are tested through the Orthopedic Association Foundation for hips and elbows. In addition to these standard test, we also test our dogs via Paw Print genetics for potential genetic health issues that could be passed to offspring. All of our breeding dogs are certified for breeding through the ALAA before being bred. Contact us today for more information. Due to our high standards of testing, socialization, bloodlines and breeding for temprament and intelligence,we are confident that a Texas Labradoodles bred dog is the very best of our breed and all dogs. Getting to know our families is one of our favorite things about raising these amazing dogs, so it’s important to us that we take the time to ensure our dogs go to wonderful families. This attention to detail has brought us countless stories of incredible people that we’ve met by sharing our precious dogs.